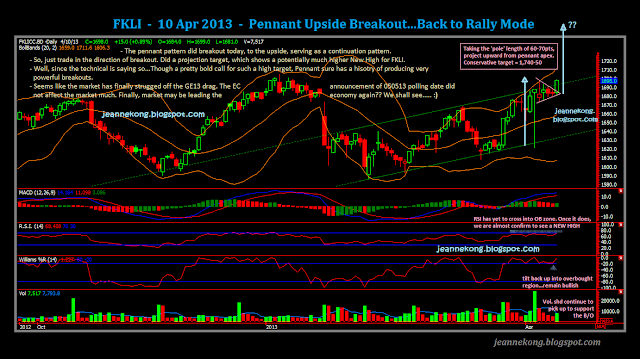 A quick one on today's FKLI & FCPO, as both has got some pretty crucial development during today's trading. 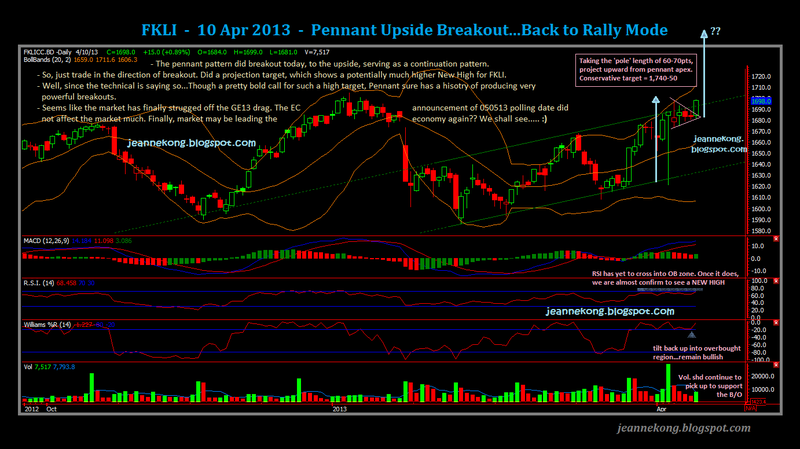 - Pennant breakout to the upside. - Projection target indicates potential new high for FKLI. - Resumption of previous rally, sentiment is strongly bullish. - Watch if the 1,705 peak is gonna hold the bulls for a while. Resistance @ 1,705 | round numbers/intervals of 10 - 1,710...1,720...etc. Nonetheless, if the 1,705 peak is to be overtaken, 1,750 will be pretty realistic a target. CPO on the other hand, is on the downside today. Price got a short-lived spike after today's seemingly bullish MPOB March'13 data. However, price succumbed to furious selling that saw an afternoon drop from 2,416 high all the way back down to close at 2,370 day low. 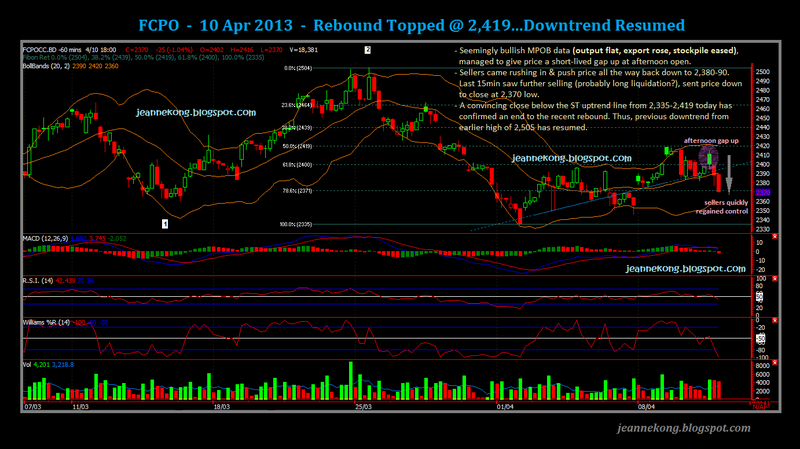 Price is now convincingly below the ST uptrend line supporting the rebound from 2,335-2,419. Hence, a confirmation of the end of the rebound at 2,419 high, followed by a resume of the previous downswing from 2,505 high in Wave 3(v). Dow closed at another new high of 14,673. Coming closer to my fibo projection of 15,000-15,100 level. Technical wise, DJI will continue its bullishness, unless we have a surprise from the FOMC Minute tonight, or disappointing earnings from heavy-weight Dow components. Note: There's a USDA Report coming out tonight at 1200 EST. FOMC Minute due at 1400 EST. Prepare to vote @ 050513!! Ya. Im using NV charts. Colorful?? haha, too artistic for trading then...lol. Been trading full-time since late last year. Jeanne, what's trade style you more on? long/short term position or intraday? you must be able to control the emotional and psychological problems before as full time trader, any advice for those want to become full time trader? I hold swing positions on FKLI (basic income), & day trade CPO (extra pocket money). The truth is, I was kinda 'forced' to quit my day job earlier than expected (long & sad story), came in short of my initially planned starting capital. Turned full-time anyway, coz I believe in forcing myself out of comfort zone to achieve higher goals, also I believe I have found my direction in the trading business. Remember this, traders are not God, we are still humans, i.e. we can get emotional. I got tricked by the 'news' during the April03 dissolution roller-coaster too. Technical says buy, but I'm too 'convinced' that its gonna be a winner to short on dissolution announcement. - Learn, Experience, come out with ur own trade setup that can give u an 'edge' against the market. - When ur setup appears, check the Risk"Reward ratio, if satisfiable, take the trade, DON'T STOP & THINK. - Then also, do treat each of ur trades EQUALLY. No one trade MUST BE A WINNER. Start treating ur trades equally, manage ur risk with strict discipline, then u'll find CONSISTENCY in ur trades & also ur PSYCHE. I actually started off quite sloppily, big fluctuations in wins n losses. Went all haywire with my psyche. It's the 'no turning back' factor that keep pushing me to 'evolve' for better, keep learning & adapting, especially the risk management & trading psychology part. At some point, any traders will have equipped themselves with sufficient TA skills. The only thing that differentiate the consistently-winning from the still-struggling group is TRADE MANAGEMENT & PSYCHOLOGY. I'm thinking sharing this in a new post. Hope u don't mind that. Btw, ur a broker with DBS? Well, FKLI has been giving me some trouble recently, going sideways, kena 'pay cut'! Also, my FKLI position setup can give me an average 20pts/contract/mth, which is sufficient to cover my monthly expenses. Of course, CPO house more opportunities relative to FKLI. 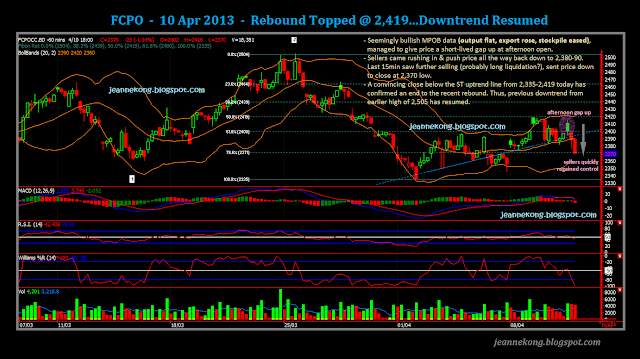 Even day trading it is enough to give lucrative profits. As I said, after my account grow to the extent I planned, I'll most likely switch to major in FCPO day & positions, will eventually add in E-mini Dow/S&P also. CPO I analyze the hourly & 15min if I day trade. I do hold positions if the entry is nice & its a Wave3/WaveC, coz wave3 often spot opening gaps as it progress, don wanna waste those gaps, u know. My blog, haha, when u see I missed a daily post, it'd be that there's not much change to the market trend (following previous post), or it's just that I'm taking time to laze a bit/holiday. I'm just human...haha...I can be lazy sometimes. U can drop me a mail for easier communication.